APRIL 2008 -- We hope you have taken in new members to tell the Deputy when they make their visits. We hope you have a look at the Blue Book too for all of the contests we have for you. Note: Contest year is July 1, 2007 to June 30, 2008. We would like to see a lot more entries. We hope at least entry will come from each one of you. Let us know what you have been doing! Try making a poster so we will have lots of entries. 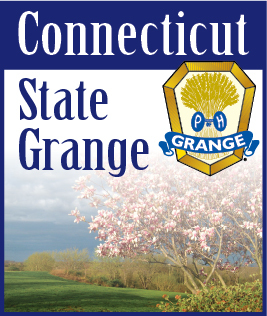 The poster is to be at State Grange Session on Thursday, October 16, 2008. Don't forget to ask if you can put one in the town hall or library in your town. Most towns are very supportive of local groups like the Grange.